From Colosseum is a terrific "Chestnut" hooded sweatshirt in a dual blend fleece. Distressed screen printed design of Indiana Hoosiers IU. Tonal sleeves and hood complete the styling. Made in an 8 oz. 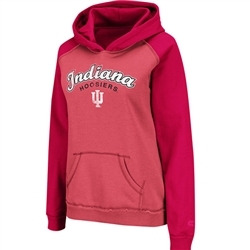 fleece of 55% Cotton/45% Polyester. This hoodie will become a favorite! Ladies sizes only!